A woman in Las Vegas was caught on camera acting on what witnesses say was a fit of road rage. On March 2, a woman got out of her car in the middle of traffic and started slugging another woman’s car with a baseball bat, KTVN reported. Witnesses say that one car cut off another and that the two started trading insults. 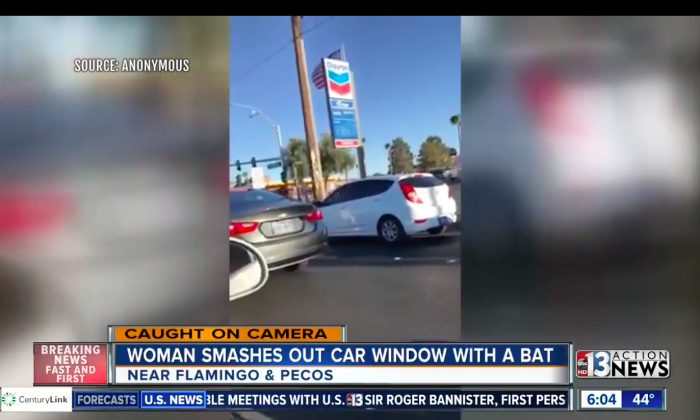 When traffic came to a stop at a red light at S. Pecos and E. Flamingo roads, one woman got out of her car with a bat and started smashing the other’s windshield, WCBV5 reported. “The girl was pounding, trying to get the other girl out of the car,” an unidentified witness told KTNV. “That is the first time we’ve seen something crazy like that,” another witness said. Someone in a nearby car who recorded the incident on her cell phone said she was worried that the bat-wielding woman would come for her next. Another unidentified woman, who was directly behind the attacker’s car, told KTNV that the driver of the car, a male, acted aggressively toward her when he saw her recording. “When he seen me recording, he yelled at me and he’s like, ‘Can I help you?’ and I said, ‘No, we’re just recording,” she said. The bat-wielding woman, who appeared to be the passenger in a black BMW sedan, was able to get away and is still at large. Anyone with information is asked to call the police at 702-828-3111.